Dracula: A Chamber Musical is a 1997 Canadian musical adaptation of Bram Stoker’s 1897 novel Dracula. The book and lyrics are by Richard Ouzounian and the music and orchestration are by Marek Norman. 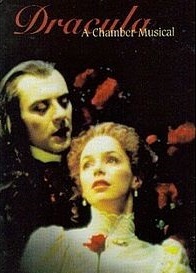 After premiering at the Neptune Theatre in Halifax, Nova Scotia, in 1997, Dracula in 1999 became the first Canadian musical to be staged at the Stratford Shakespeare Festival. Dracula was a popular success, enjoying a six-month run. Ouzounian, who was head of creative arts programming for TVOntario, arranged for the musical to be filmed and broadcast in collaboration with CBC Television. The special earned Juan Chioran a 2000 Gemini Award for Best Performance in a Performing Arts Program or Series for his portrayal of the title role. Dracula has since been staged in regional theatres across the United States and Canada.